The growth of donor-advised funds is one of the biggest stories in philanthropy. Over the past half decade, the amount of money held in these funds has more than doubled, as has the annual value of grants flowing out. Of the four largest grantmaking institutions in the U.S., two are donor-advised funds. We’ve hosted strong arguments at IP about both the pros and cons of donor-advised funds, with critics and defenders alike making some great points. Yet there is one critique of DAFs that even their biggest boosters haven’t much bothered to rebut: They aren’t transparent. When a donor gives through a private foundation, you can pull the 990s and see what that donor is doing with their money. In contrast, DAFs are the philanthropic equivalent of numbered bank accounts. You can look at the 990s of top donor-advised funds like Fidelity and see all the grants it made. But you can’t match up any of those grants with the donors behind them. In 2015, Fidelity made a stunning $3.1 billion in grants, nearly as much as the Gates Foundation. Yet we know zilch about who gave actually all that money. The other thing about big donor-advised funds is that there’s been no easy way to search through the blizzard of grants they make every year, since you won’t find a grants database at Fidelity, Schwab, or Vanguard. The rise of DAFs is a big reason why philanthropy has been growing less transparent lately – despite two decades of talk about bringing more sunlight to the sector. 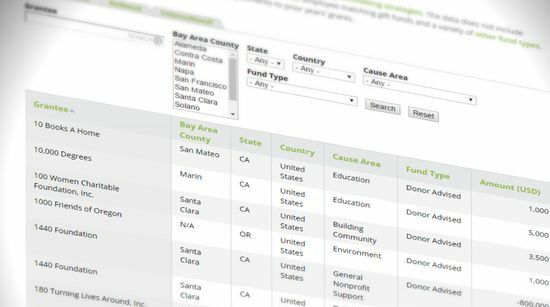 Now, in a major and positive step forward, the Silicon Valley Community Foundation has unveiled a new grants database that reports every grant made out of its DAFs (as well as other funds) in 2015. The data covers $479.7 million in grants, which is not all the money that flowed through SVCF last year, its biggest year ever, but catalogs the most important giving. If you scroll through the long lists of grants, organized by category, you’ll get the clearest look to date at where this philanthropic powerhouse—and the many donors behind it—are directing money. The lion’s share of funds, $261 million, went to local nonprofits. The next biggest slice, $155 million, went to national groups. Just $13 million or so was given internationally. Those raw numbers right there are quite illuminating. They suggest that the winners of Silicon Valley are, in fact, keenly interested in giving back in their own communities—but that these philanthropists, true to reputation, also have grand ambitious to tackle problems on a larger stage, especially in areas such as education, medical research, and the environment. Related: Holy Cow, This Community Foundation Is Exploding. Why Is That? Now to my big “but” about this database. It still doesn’t give us any clue as to who has DAFs at the Silicon Valley Community Foundation or where specific individuals are directing their money. So for example, while we can now see more clearly that SVCF’s donors are pumping many millions of dollars into education reform groups, including top charter networks, we don’t know who any of these donors are. Because philanthropic dollars can and do buy influence in American life, and it’s nice to know who’s doing the buying. Yet instead, even as we’ve entered a period in which more donors are writing bigger checks to promote this or that cause, it’s become ever harder to follow the money. To be sure, there are plenty of practical reasons for wanting to give anonymously—starting with a desire to not be besieged by solicitations. But in my view, the public’s right to know who’s deploying wealth for what purposes in our society is a greater imperative than a donor’s right to privacy. Philanthropic freedom is an important principle, but it has to be squared with other democratic values we care about as Americans. So far, the debate on DAFs has mainly focused on their payout rates and the warehousing of tax-deductible wealth. But as this giving vehicle becomes ever more popular in an era of activist philanthropy, the transparency problem needs to move front and center in discussions of how to fix DAFs. In closing, though, let’s return to the good news here – which is that SVCF has taken an important step in the right direction of more transparency. Hopefully this move will set a new standard that the other DAFs will rise —and sooner rather than later.